The availability of 4K Ultra HD TVs has increased dramatically, but the availability of native 4K content to watch, although increasing, has lagged behind. Fortunately, Netflix is offering a good deal of it via internet streaming. Netflix can be streamed to almost any television today; including but not limited to those manufactured by LG, Samsung, Panasonic, Sony, and Vizio. OK, you are excited, you have a 4K Ultra HD TV and subscribe to Netflix, so you are almost ready. To watch Netflix in 4K, your TV (and you) have to meet several requirements. Is your TV smart? Your 4K Ultra HD TV has to be a smart TV (able to connect to the internet.) Most are these days but you'll need to check if you have an older set. You must have HEVC: In addition to being a smart TV, your TV also has to have a built-in HEVC decoder. This is what enables the TV to decode the Netflix 4K signal properly. Your TV has to be HDMI 2.0 and HDCP 2.2 compliant: This isn't a specific requirement for Netflix streaming via the TV's internet streaming function, but 4K Ultra HD TVs with built-in HEVC decoders also include this HDMI/HDCP feature so that you will be able to connect to external 4K sources to the TV. These sources can be anything from Ultra HD Blu-ray Disc players or cable/satellite boxes to 4K-enabled media streamers, such as offerings from Roku and Amazon, that will provide native 4K content. Netflix offers a regularly updated list here. Unfortunately, not all 4K Ultra HD TVs have the proper HEVC decoder or are HDMI 2.0, or HDCP 2.2 compliant — especially sets that came out before 2014. However, since that time there has been a steady stream of Ultra HD TVs that meet 4K streaming requirements from most brands, including LG, Samsung, Sony, TCL, Hisense, Vizio, and more. In order to stream Netflix 4K content on specific Ultra HD TV models from each of these brands, the TV has to be a model that was released in 2014 or later and has the Netflix app installed, plus you must have a subscription plan that allows you to access Netflix's 4K content library. If you aren't sure your specific TV model or Netflix subscription plan fits the requirements, definitely contact customer/tech support for your brand of TV, or contact Netflix customer service for the latest info. In conjunction with a fast broadband speed, you should also connect your Smart Ultra HD TV to the internet via a physical Ethernet connection. Even if your TV provides Wi-Fi, it can be unstable, resulting in buffering or stalling, which definitely ruins the movie viewing experience. However, if you are currently using Wi-Fi and haven't had a problem, you may still be OK. Just remember, 4K video contains a lot more data, so even minor interference can cause problems. If you encounter problems using Wi-Fi, Ethernet would be the best option. Be aware of your monthly ISP data caps. Depending on your ISP (Internet Service Provider), you may be subject to a monthly data cap. For most downloading and streaming, these caps often times go unnoticed, but if you are venturing into the 4K territory, you are going to be using more data each month than you are now. If you don't know what your monthly data cap is, how much it costs when you go over it, or even if you have one, contact your ISP for more details. It is important to note that being able to stream 4K content from Netflix, doesn't mean that all of Netflix is now magically in 4K. Some program selections include: "House of Cards" (season 2 on), "Orange Is The New Black," "The Blacklist," all seasons of "Breaking Bad," "Daredevil," "Jessica Jones," "Luke Cage," "Marco Polo," "Stranger Things," as well as select feature films that are cycled monthly. Some titles include/have included, "Ghostbusters," "Ghostbusters 2," "Crouching Tiger," "Hidden Dragon," and more, as well as several nature documentaries (which also look great in 4K). You can find out if your TV is getting the 4K stream by accessing your TV's info or status menu (different for each TV brand — consult user guide it needed). The info/status feature should display the resolution of the incoming video signal. If it says 4K, UHD, 3840x2160, or 2160p, you are good. However, if it turns out that your status information indicates 1080p (1920x1080) or lower resolution, you are not accessing the 4K streaming version of your selected content. If you are receiving 4K Netflix via a compatible external media streamer, and that streamer is connected to your home theater receiver en route to the TV and you are not getting a 4K stream - the home theater receiver could be the problem. To test this, disconnect the HDMI output of the media streamer from the Home Theater Receiver and connect it directly to the TV — if that solves the problem, then you found the workaround for the time being. Another added bonus is that some 4K Netflix content is HDR encoded. This means that if you have a compatible HDR TV, you can also experience enhanced brightness, contrast, and color that gives the viewing experience a more real-life natural look with select titles. What Does 4K Netflix Look and Sound Like? Of course, once you access 4K streaming via Netflix, the question is "How does it look?" If you have the required broadband speed, the result will also depend on the quality, and, frankly, the screen size of your TV - 55-inches or larger is best viewing the difference between 1080p and 4K. The results can look pretty impressive and can look a little better than 1080p Blu-ray Disc, but still doesn't quite match the quality you can get off of a physical 4K Ultra HD Blu-ray Disc. Also, in terms of audio, the surround sound formats available on Blu-ray and Ultra HD Blu-ray discs (Dolby TrueHD/DTS-HD Master Audio) provide a better listening experience than the Dolby Digital/EX/Plus formats available via the streaming option on most content. There is some support for Dolby Atmos (compatible home theater receiver and speaker setup also required). 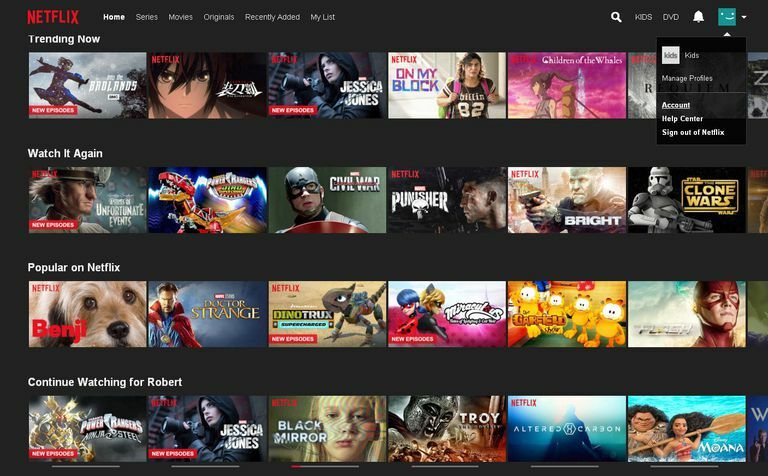 Although Netflix was the first content provider to offer 4K streaming, more options (based on most of the technical requirements listed above) are starting to become available from content sources directly through some 4K Ultra HD TVs, such as Amazon Prime Instant Video (Select LG, Samsung, and Vizio TVs) and Fandango (select Samsung TVs), UltraFlix (Select Samsung, Vizio, and Sony TVs), Vudu (Roku 4K TVs, select LG and Vizio TVs), Comcast Xfinity TV (only available via select LG and Samsung TVs), Sony Ultra (select Sony TVs).